A beautifully decorated yurt door from Moynaq. This yurt won the annual town competition for the best yurt of 2004. The external decoration of the Karakalpak yurt is designed around the entrance door, creating a welcoming atmosphere to both owner and guests alike. 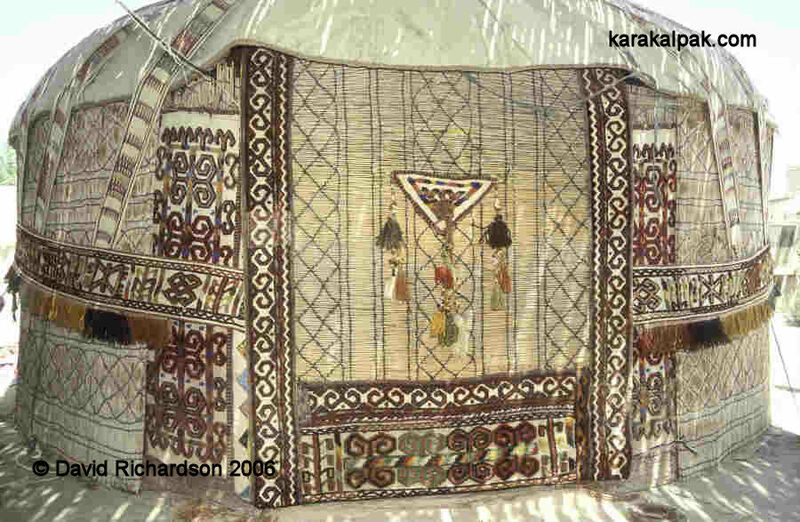 The doors of Karakalpak yurts were often plain and undecorated. Carving and in particular painting of the doors in bright colours became more popular in the 1940s and 1950s. In the 1920s and 1930s this had been considered to be a ‘Qazaq taste’. According to Savitsky some craftsmen preferred to use Amu Darya willow (Salix oxica, known locally as sog'ıt), or pine (qarag'ay) for the door panels. According to our research sog'ıt was indeed used for door panels but its botanical name is Salix alba. Salix oxica is in fact aq tal. It also seems strange that he refers to the use of pine, as both pine and birch (qayın') are generally considered by Karakalpaks to bring misfortune and sterility. An early 20th century Karakalpak esik with a duwashıq amulet and a lower suwag'ar. 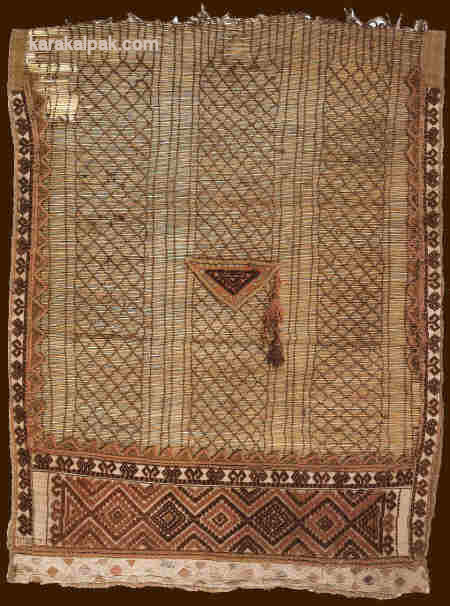 Item 8762-23901 from the collection of the Russian Ethnography Museum. 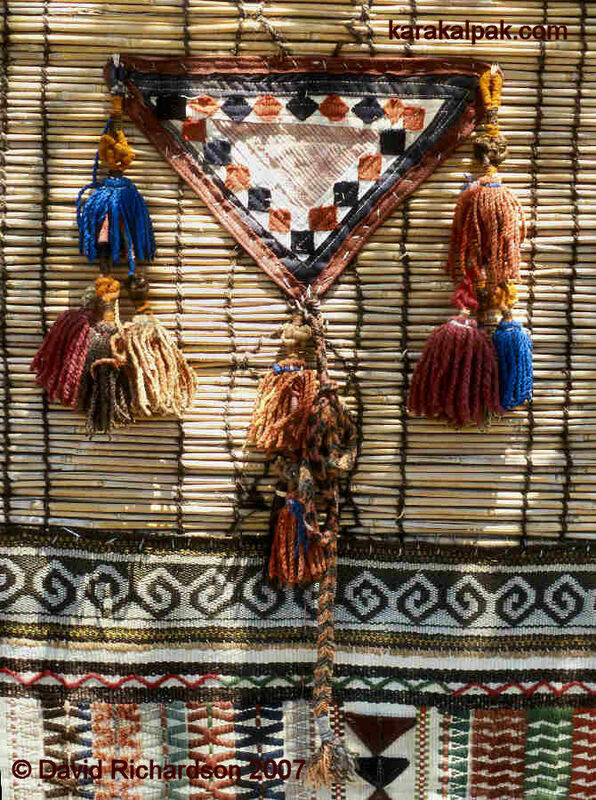 Esiks are ornamented in a traditional way with vertical strips in appliqué or combination technique sewn onto the sides. These are known as shiyqayıw. Another horizontal strip is sewn onto the bottom of the esik overlapping the shiyqayıw, designed to prevent the ingress of water. This is known as the suwag'ar. 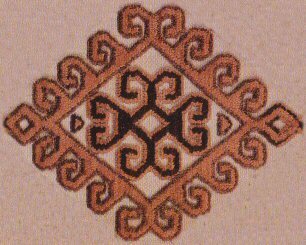 In the centre of the esik is sewn the duwashıq. The duwashıq on an esik or outer door of a yurt in one of the northern suburbs of No'kis. This is made from material in the form of a triangle with the point facing downwards. It generally has tassels at each of the corners. The shape of this triangle calls to mind the tumar amulet and it is connected with pre-Islamic beliefs. Similar protective triangles can be seen on the back of men’s postın coats, and on children’s clothing. In the past pieces of paper with verses from the Qu'ran were sometimes put into a pocket in the duwashıq, thereby fulfilling a similar role to the ha'ykel worn by girls and women. This site was last updated on 8 February 2012.